MORE Stands in Solidarity with Sarah Chambers! How do we think a department of education should respond to teachers who consistently advocate and organize their community around policies for educational justice? 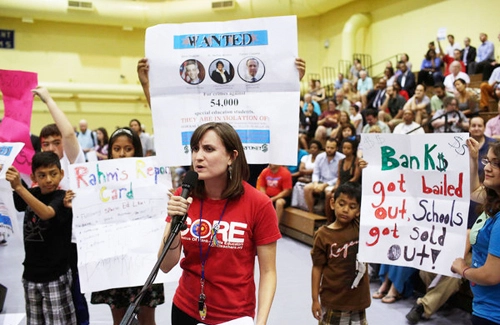 In Chicago, the governing elite go after the teacher. Sarah Chambers, special educator at Maria Saucedo Scholastic Academy and co-chairwoman of the Chicago teachers union’s special education task force, has been speaking out against the devastating cuts that have led to many of Chicago’s public schools to be out of compliance in providing special education services. Under Mayor Rahm Emanuel, millions of dollars in budget cuts have meant millions diverted to corporate interests. Sarah has been at the forefront of exposing the privatization efforts in Chicago. Her fearless and relentless commitment to justice, for all public school students and educators, landed her a letter of suspension from the Chicago Public Schools earlier this month. While specific charges are still being contrived by officials and pending a hearing date, she cannot return to her school community or school. Sarah is a member of the Caucus of Rank and File Educators (CORE) which successfully unseated its business-as-usual union leadership in 2010. MORE and our national network of caucuses understands how this attack on Sarah is indicative of just how threatened Chicago’s governing elite are feeling and are using this opportunity to test our ability to fight back. This injustice has sparked an onslaught of public solidarity, calling for the bogus charges to be dropped and for Sarah to be reinstated at her school where she should be be working with her students. If you have not signed the petition that is nearing 4,000 signatures, please do so now and share! In New York City, we face abusive administrations daily. Advocating for our students and our profession is something we must protect and defend. Sarah’s fight is our fight and we look to this as a model for how we can support each other in our city. Sarah serves as the most senior special education teacher at Saucedo today and a tireless champion for her students. As Saucedo faced increasing budget cuts with special education, Sarah has taken on a larger and larger caseload within Saucedo. Sarah continues to work hard to make sure her students got the education they deserved. She is a leader within her school’s GSA which creates safe spaces within Saucedo for students.